1 Burning Question: Moving Forward or Stepping Back? 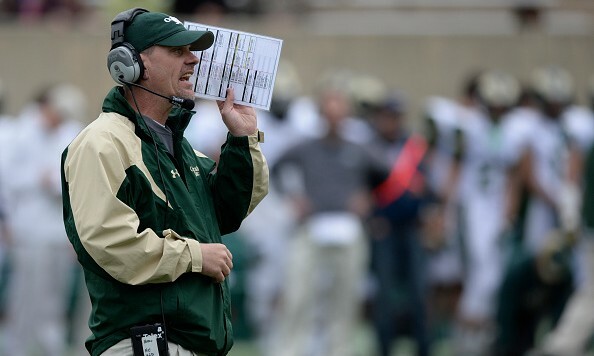 Colorado State was one of the most pleasant surprises in college football last year. Not only did the Rams win 10 games for just the fourth time in school history, they also qualified for back-to-back bowl games, which they hadn’t done since Sonny Lubick guided the team to five straight from 1999-2003. This begs the question: will this year’s team take a step back or simply pick up where it left off last season? Despite losing head coach Jim McElwain to Florida, there are plenty of reasons to be optimistic about this year’s team. Mike Bobo takes over for McElwain after leading Georgia to an average of 34.1 points and 420.5 yards per game over the past seven seasons. He’ll have plenty of talent to work with, as CSU returns four of its top five targets from last year, including Biletnikoff Award Finalist Rashard Higgins (96 catches, 1,750 yards, 17 TDs). The ground game is also in excellent shape, welcoming back five players with starting experience from a unit that averaged 5 yards per carry against Power 5 opponents in 2014. On the other side of the ball, there’s a lot to be excited about as well. Safety Kevin Pierre-Louis (85 tackles), safety Trent Matthews (3 INT, 8 Pass Break-Ups), cornerback Tyree Simmons (3 INT, 5 PBU), and nickel back Preston Hodges (1 INT, 7 PBU, 3 INT) return to anchor a secondary that finished fourth in the Mountain West Conference in passing defense. In addition, the Rams welcome back their top six pass rushers from last season, including Cory James (6.5 sacks), Joe Kawulok (3.5), and SteveO Michel (2). The Rams also have a relatively favorable schedule, playing three of their four toughest opponents within the friendly confines of Hughes Stadium. 5.7 — The number of yards per carry that Colorado State averaged at home last year. As most college football coaches will tell you, the key to winning football games is to establish the run. 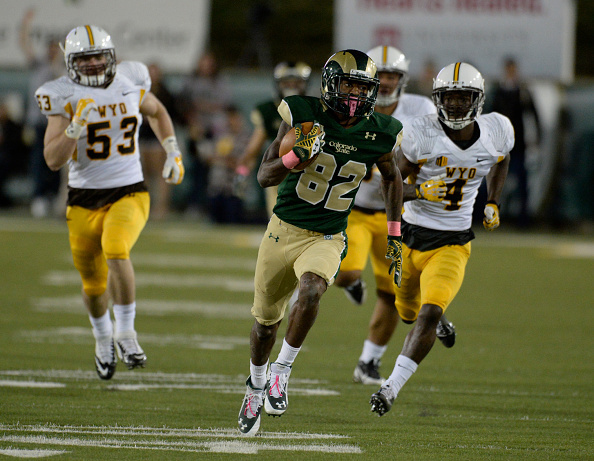 The Rams did that last year, running for an average of 211 yards per game when playing at Hughes Stadium. CSU will need to have more of the same this fall, since it plays three of its four toughest games at home. 87 — This was Colorado State’s national ranking in total defense in 2013. Let’s be honest: defense wins championships. If the Rams are going to compete for the Mountain West title, they must do a better job defensively, especially against the run (98th in the country, 200.7 yards per game). With new defensive coordinator Tyson Summers – whose UCF squad ranked fifth nationally in total defense – implementing a 4-3 under scheme that’s a better fit for CSU’s personnel, this could be one of the most improved units in the country. Why it matters: The Aggie defense led the league in fewest yards per play in each of the last two seasons. This swarming D – led by all-conference linebacker Nick Vigil – makes a Utah State a serious threat to win the Mountain West championship… especially if quarterback Chuckie Keeton can remain healthy. Why it matters: The Broncos return 16 starters from last year’s squad, which captured the Mountain West title and defeated Arizona in the Fiesta Bowl. They’ll be a heavy favorite to win the division again this fall, making this a must-win game in order to play for the conference championship. Why it matters: This is the most important rivalry game on the schedule. Sure, beating Colorado is nice, but a win over Air Force could be the difference between finishing in the upper half of the division or staying home for the postseason. Rashard Higgins, WR — Higgins was the best receiver in college football in 2014, leading the country in both receiving yards (1,750 yards) and touchdown receptions (17). He became more dangerous as the year progressed, averaging 176.57 yards per game over the final eight games of the regular season (sat out against Hawaii due to injury). Expect him to be the focal point of the Ram offense this fall. Steven Walker, TE — Walker earned first-team All-Mountain West honors last season, catching 30 passes for 279 yards and 4 TDs. He should post even bigger numbers this fall, as Bobo’s offenses have always done a great job at utilizing the tight end in the passing game. Trent Matthews, SS — Matthews was the most versatile player in the Rams’ secondary, which finished fourth in the conference in pass defense last year. He excelled against the pass, leading the team with three interceptions, while finishing second in passes defensed with eight passes broken up. He also contributed in run defense, registering 54 tackles, and provided a spark on special teams, blocking two kicks. Cory James, WLB — The most consistent pass rusher on the team over the last three seasons, James has recorded 30.5 tackles for losses (TFL) and 21 sacks in his career at CSU. He’s also forced four fumbles and broken up three passes. He’ll be the anchor of the front seven this fall. Tyson Summers is one of the brightest defensive minds in college football. In his lone season as defensive coordinator, he helped UCF improve from 29th to 5th nationally in total defense. He will enjoy similar success at Colorado State by implementing the 4-3 under this fall. This scheme is a better fit for the Rams, which never had the size necessary to run the 3-4. By allowing his defensive linemen to make plays, rather than occupying blockers, the CSU defense will improve dramatically against the run. In fact, they’ll be so much better that…. With an improved run defense, the Colorado State will defeat the Golden Gophers. Minnesota hasn’t fared well when it averages fewer than 3.5 yards per carry, limping to a 1-6 record in such games over the past two seasons. With the ground game sputtering, the Gophers will have to rely on their passing game (141.8 yards per game) to move the ball against the Ram secondary, which allowed only 204 yards per game at home last year. Considering that UM eclipsed that total only once last season (240 yards in a 28-24 loss to Illinois), Colorado State has to like its chances. Let’s be honest: Higgins should have won this award last season since he posted better numbers than anyone else in the country. He led the nation in both receiving yards and touchdown catches, and averaged 176.57 yards per game over the final two months of the regular season. Look for Mike Bobo to get the ball in his hands early and often, resulting in another monster year, which will make him the first receiver from a non-power conference school to win this award since Troy Edwards did it back in 1998. Make no mistake about it: there’s no replacing Garrett Grayson, arguably the greatest QB in school history. However, Bobo has done an excellent job developing quarterbacks over the years, molding David Greene, D.J. Shockley, Matthew Stafford, and Aaron Murray into next-level signal callers. Given this highly successful track record, there’s no reason to think that this year’s starter won’t be productive. While the Rams have enough firepower to win shootouts if necessary, the improvement on defense will make this year’s team a MWC title contender. As long as Colorado State can win one of the three key games listed above, all it would need is an upset of over Minnesota (which I predicted will happen) or a victory in a bowl game to reach 10 wins. Terry Johnson is the Associate Editor for The Student Section. He is a member of the Football Writers Association of America and the National Football Foundation.